UPDATE: The Keyboard Company did Keyboard Company Filco Majestouch Convertible 2 Review on April 20th. It’s shorter, but good! Also has some pictures. Related: In case you missed them, I wrote some blog posts about discovering the things that are mechanical keyboards, and about my decision to purchase this specific one, before I wrote the below review. Sunday evening, I got a robocall from DHL Express with a tracking number and the announcement that they were delivering a package “tomorrow” (Monday). Sweet, and insanely fast! Sure enough, the online tracking showed the package in Cincinnati, OH and by around 5:30 am on Monday morning, it checked in to the Indianapolis DHL location. But it never listed Out For Delivery (and showed End of Tuesday as delivery-by), so I called just after noon and asked about it. They person I spoke with told me that yes, the package was in, but no, the robocalls have been off by a day lately and the package wouldn’t be delivered until tomorrow (Tuesday), like the “end of March 24th” indicated online as well. But, since it was in the local facility, she said, it was fine if I wanted to drive over and pick it up on Monday before they closed at 8pm. So, around 4:30 pm, I drove the half-hour to the DHL Express location and…they didn’t have it. Couldn’t find it, complained up one side and down the other that the person on the phone shouldn’t have told me I could pick it up, and said it didn’t have the proper destination scan to indicate they physically had it yet. She was sorry for the trouble, but it would be delivered on Tuesday early afternoon and she would call me Tuesday morning to confirm it. I was also able to leave a signature release since I had to leave to take my wife to the airport during the day. Finally, Tuesday comes. I worked half a day, took the afternoon off (airport drop off, remember?) and headed to the airport. Of course it would be delivered while I was gone, just after 2 pm, and when I got home I opened it up, looked at it for a couple of minutes, and ran an errand that needed running with the kids. Finally, got back home, and before I made the kids pizza for dinner I got to read the manual and do a little playing! Time to play! I unpacked the keyboard and the Blue O-rings, which were in a bag. Set the O-rings aside for later, popped open the two included AA batteries, and stuck them in the keyboard. Played with the key feel for a few minutes, then unwound the very nice USB cable (Mini USB on the keyboard end) with attached Velcro tie and plugged it into my Surface Pro 3 dock. Blam! It types! Almost like it’s a keyboard, ha! After I’d goofed off typing nonsense into a blank OneNote page for a while, I broke out the manual and read the English part cover to cover (English isn’t the first language in the manual, it starts on page 20, and is 15 pages long). The English isn’t native-good, but it’s a readable translation, if a bit clumsy. I was mainly concerned with the Bluetooth operation and switching between devices, since this keyboard will support four different Bluetooth devices and USB, all switchable on command. It can also use USB for power while typing on Bluetooth (regardless of battery presence; it recommends not keeping batteries installed while using extensively on USB). I know USB to Surface Pro 3 works, so let’s give Bluetooth a try. There’s a very nice, subtle Bluetooth power button at the top-middle of the keyboard, not hard to press but easily to ignore otherwise. Power it on, hit the Bluetooth Clear button above the number keypad’s minus symbol (first time only) and then press Ctrl+Alt+Fn followed by the 1 key (keys 1 through 5 above the letters function in concert with the key combo just mentioned to switch between the four Bluetooth devices and USB functionality). At around the same time, I opened Change PC Settings->PC and Devices->Bluetooth and it located a “Keyboard” device (since the keyboard was in discovery mode from the above key combo), which I tapped and it prompted me to type a numeric code and press Enter on the keyboard. Done and Done. Now renamed the Majestouch Convertible 2 and listed as Connected, I can now type equally as well via Bluetooth, sans cable. This is great! Test number two, let’s try my iPhone. Ctrl+Alt+Fn, 2 enables discovery mode to pair device 2. Enable Bluetooth on iPhone, go to Settings->Bluetooth, tap Keyboard, enter code and Enter, and it’s Connected now as well. Just like other iPhone keyboards I’ve used, this also works great! I will not use this keyboard primarily with my iPhone, but I’ll definitely use it occasionally. Now, switching between the two is as simple as Ctrl+Alt+Fn followed by 1 or 2, for Surface Pro 3 or iPhone, respectively. The media keys on F1 through F8 (Volume up/down/mute, Skip Track forward and back, Play/Pause, and Stop) seem to work fine in limited testing on the computer and on the iPhone which is nice. The Fn+Sleep (F12) key puts my Surface to sleep and even wakes it up from a light sleep. The only things I miss a little from other iPhone keyboards is the ability to press the home button, which I can’t find a way to do from the Convertible 2, and a way to press “Send” (such as in Messages or Facebook where you’d normally tap the Send button on-screen). Enter goes to the next line, and Ctrl+Enter either does nothing or also inserts a newline, but neither triggers a send. No huge loss, I can reach up and tap the screen, but so far it’s the only thing this can’t do (typing-wise). Light-wise, the Num and Caps lights double as Antenna and Battery Indicator lights, but other than status while in pairing mode or switching modes, the lights remain entirely off (even with Caps Lock or Num Lock enabled) during Bluetooth use, regardless of whether powered via USB or battery. When in USB-connected mode, the lights indicate Num Lock (blue) and Caps Lock (red) continuously like most keyboards, when those are on. They’re pretty bright if you look at them straight-on, but are fine from typing position. It feels so good, like I knew that it would! It feels so nice, like sugar and spice…ok, enough of the slightly modified song, this keyboard feels great! The key travel is so much better than the Surface Pro 3, and comparable (maybe a bit farther) than my Microsoft Natural keyboard, but definitely less resistance and very speedy. I did try out the keyboard without the O-rings first. The sound is much as I’d imagined it, having tried the Cherry MX Blues and opting for Browns with just one sample key. Definitely some key-striking sound to it, and the tactile “click” is there but it’s not audible (most of the sound is either from the sound of my finger on the key or from the key itself bottoming out). Just as described, but it’s really hard to imagine without trying it! I think Brown was the right choice. I would definitely enjoy Blue as well, but as I’ve said before, I think I would slow my typing to make the Blue “clicks” sound like a nice rhythm, whereas the Browns sound great as fast as I can go. They’ll also cause less irritation to anyone around me; sometimes this won’t matter and people won’t care, and sometimes it might be a big deal, but this isn’t really louder than my Microsoft Natural keyboard and might be quieter sometimes. I purchased the Blue O-Rings with my keyboard not knowing how much I’d like them, but knowing it would quiet the keyboard a little and reduce overall travel, potentially making it easier to type lightly and adding some padding to reduce finger fatigue (so they say). They’re a bit thicker than the Black O-rings I got with my Max Keyboard sampler (as advertised), but barely (I say barely, but the whole key travel distance is 4mm with activation at 2mm, so we’re already talking tiny here!). I installed the O-rings on a few keys and it was hard to tell how much I liked them, so I went ahead and installed it on all standard-sized keys from Q down to /. I left all numbers, function, and special keys alone, those weren’t my main concern anyway. If I did any others, it would be Space, Shifts, and Backspace. I’m not sure yet how much I like with vs. without the O-rings. It’s quieter, a bit “softer” sounding. Not tremendously, so, but it’s noticeable. Definitely less “clacking” except when I tap Backspace (which is O-ringless); that one clacks pretty loudly when I rapid-fire a correction! I’m going to give the O-rings a try for a couple of days (I think). I do mostly like the slightly shorter travel, though my left hand, being my weaker one, seems to feel a bit more tension (which is does on my really short-travel Surface Pro 3 as well) when typing with the shorter travel. Hard to tell for sure as I used the keyboard without the O-rings for such a short time. I’ll probably take them out at some point and give it a workout without them. The keyboard comes with a Filco Key Puller tool, and it took some time to put the rings on but it wasn’t bad. A toothpick came in quite handy for getting the rings pushed all the way down; my fingers are too big to fit into the keys! Typing is very fast and comfortable. A typing test I randomly found online pegged me as high as 99 words per minute (as low as 80 with more complex material) with some brief tests and between high and perfect accuracy. That seems about right; I’ve hit that sort of speed before on my Keytronic Lifetime Designer keyboard in my teens (I still have it but it’s PS/2) and have only intermittently tested myself elsewhere, on keyboards I don’t recall, since then. The words flow fast and free, is my point, which was of buying this keyboard, the point! Here I surpass 1800 words in this post and I’m still enjoying myself, so we’ll see how much more I subject you to (hey, I’m not forcing you to read this! My wife would agree, but it’s doubtful she’ll make it this far). Bluetooth keyboard. Remote work locations. Portable computer, large keyboard (heavier than the computer). What does all this mean?!?!? I need a case! Keyboard cases for traveling with full-sized mechanical keyboards are not the most common thing to find online, but with a bit of searching I managed to track down some Reddit posts with a few links, and after some further research, I ended up ordering a Grifiti Chiton Fat 17 sleeve that looks about the right size and is only $15 with Prime shipping. There’s also a manufacturer’s page and the Massdrop discount page with 3 days left on a discounted version. I almost bought it at Massdrop, but it doesn’t ship until April 10th and with shipping it’s $13.74, so the savings wasn’t worth it for me. If I were buying multiples and could combine shipping the $8.99 pre-shipping price was pretty nice. 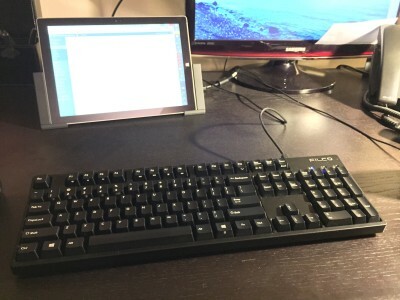 While at Amazon, I also picked up Anker phone/tablet stand to make it simpler to use the keyboard with my iPhone when the need (ok, want) arises. Just a quick aside about another Filco keyboard that I almost bought and why I didn’t. There exists a Filco MINILA Air (MINI LAyout) model keyboard that supports Bluetooth and USB, in a very small, 60%-sized form-factor (there’s a non-Air version without Bluetooth, also). See the Diatec manufacturer’s page and the Keyboard Company Blog Review. I was very tempted by this prior to finding the Convertible 2, especially since the Convertible 2 hadn’t been released when I was doing my research. It would certainly be more portable. However, the main thing holding me back (besides the fact that I like the tenkey decently well and really like my navigation keys!) was the Bluetooth setup. It could pair with three devices, but it paired in an oldest-first manner, so whichever of your devices was on, if more than one, it would pair with the one you’d paired with the earliest. So you could have a “preference order,” but couldn’t easily change it, nor specify which device to connect to from the keyboard itself. The Convertible 2 fixes this very well as I detailed above. However, if you’re only going to use one Bluetooth device, or just one at a time, and you want a very small, tenkeyless keyboard, the MINILA Air is probably worth a look. I did like all the options available with the special function keys they added! Even if I would have preferred a simple tenkeyless layout, leaving the arrows and Delete/Home/End etc. alone. In case you couldn’t tell, I’m loving this keyboard! I’ve used it while writing this review to compose iMessages on my iPhone by switching back and forth between devices. I’m having fun on speed tests. I’m guessing, though I haven’t used it for that yet, that typing time entries for work will become more fun as well, as long as the fun holds out :-) Maybe I’ll even have to take up blogging again regularly? It’s unlikely, but possible. If you want one yourself, The Keyboard Company now has “Lots in stock!” of the Cherry MX Brown, Blue and Red varieties, and I couldn’t be happier with their service, even if I wish the exchange rate were a bit better at the moment. Other than that, it was as simple and easy as ordering from a US-based vendor! They answered my research and pre-order questions via Twitter in a timely manner (and their blog is informative), but I never had any personal contact with their team during or after the order (they did email me a tracking number). For now I’ll keep on typin’ in, just not in this blog post! UPDATE Sunday 3/22: DHL called to let me know they will be delivering tomorrow! Those planes move overseas pretty fast, woohoo! UPDATE Monday 3/23: DHL’s tracking website shows that the keyboard arrived locally at their distribution center, but hasn’t shown Out for Delivery yet, and the tracking site says delivery by end of day Tuesday (tomorrow). So, maybe they’ll make it to me to today, but it looks like I may have to wait until tomorrow despite their phone call’s robo-statement. I finally picked one. A mechanical keyboard with Cherry MX switches. You’d think it would be easy given my last post, where I said I wanted the Filco Convertible 2, and that’s the one I ordered, so that part was decided, if not originally easy. But the switches! So hard to decide between the Cherry MX Blue and Cherry MX Brown switches! A coworker has a Das keyboard with Blues that I tried for a few minutes. I like it, but my concern with Blues is that I actually like the clicking sound enough that I think I would slow down typing in order to hear the rhythm of the clicking at a more pleasant pace, plus they would be less pleasant for family (wife) and coworkers to listen to in certain circumstances (not all the time, but they would tend to be a bit louder). So my first thought was Browns, then I wavered back to Blues, and after trying the Das Blues, I’m back to Browns. I also purchased a Max Keyboard Sampler Kit to see if I could tell which I liked best (it has Red, Black, Blue and Brown sample switches). It also has O-rings that shorten the travel and dampen the sound a bit, which at first I figured would be good on the Blues but it turns out I think I like on the Browns. It also turns out that it’s really hard to tell from a set of four keys how switches will be on a full-sized keyboard! Another coworker has a keyboard with Browns at home, but I haven’t been able to coordinate having him bring it in so I can test it. But I made a decision and I’m getting the Filco Convertible 2 with Cherry MX Browns (aka Tactile Action) and a pack of Blue O-rings in case I want them! The Browns should be a bit quieter and I think that trumps the clicks of Blues in more situations than I’d prefer Blues. My Microsoft Natural Keyboard 4000, while not mechanical, has a deeper “thunk” sound vs. a click and I’m relatively happy with it’s sound. The O-rings I got are the blue ones that are a bit thicker than others; if I don’t like them and want another size I’ll buy more from Amazon or something. Literally the only place the keyboard was in stock was in the Keyboard Company store, located in the UK. But wait, it wasn’t in stock! They actually were expecting stock yesterday (Friday, March 20th) and have been for about a month, but nowhere else even knew when they might get stock (only two sites listed the model at all, and I called one to confirm they didn’t have any idea when stock would arrive). So I downloaded the XE Currency Converter app on my phone and checked the US Dollars to British Pounds Sterling exchange rate for a couple of weeks and when it went down a bit earlier this week and then just barely went up (Monday I believe) I placed the order for the keyboard and O-rings (Keyboard Company charges at purchase, not shipping, for back orders–best for my currency timing attempt!). With the credit card’s currency fees of $2.10 on top of the $210.44, the cost was $212.54 USD based on my credit card charges. Considering that includes shipping and the O-rings on the only mechanical keyboard that has both USB and Bluetooth, it’s not actually that much higher than the many USB-only keyboards in the $150 to $200 range, and since I’m going to be using it with my Surface Pro 3 (because the keyboard is all I hate, even though I’m using it now!) which is portable and only has one USB port, the Bluetooth portion is going to make me happy even though I’ll probably keep a USB cord ready to plug in on my desk attached to the Surface Pro 3 dock. The price also seems reasonable since I’ll use it in portable and wired modes, versus purchasing a separate keyboard for mobile Bluetooth use and a nicer mechanical for desk only. The fact that it switches to up to 4 Bluetooth devices (selectable–the only other mechanical Bluetooth keyboard I even considered didn’t have USB and automatically chose which device to connect to based on order of pairing; stupid when I’m using a laptop and phone at the same time!) is probably not something I’ll use every day, but having a keyboard capable of typing on my phone in a pinch is going to rock! Yes, the fact that the keyboard is 2.65 lbs and my Surface Pro 3 is 2.41 lbs (WITH its keyboard! It’s 1.76 lbs without) is kind of…weird, shall we say? “I love carrying my lightweight tablet/laptop so much that I also carry a keyboard almost twice its weight along with it!” Whatever, I’m going to enjoy typing on the darn thing and it’ll probably go with me mainly anywhere I plan to work for a half-day or more at my computer. I doubt I’ll tote it on-site to every customer, though I might for a week or two so people can get their jokes about the keyboard weight out of the way :-) I do wish a bit that the Convertible 2 was available in a tenkeyless format, and maybe it will be at some point, but I actually do enjoy having the number keypad available at times, and even if it lost that, I would want the Home/End/Del/PgUp/PgDown keys in their usual places as I use all of them (well, the first three at least) quite heavily by muscle memory, so it would need those. Only some tenkeyless keyboards still have those keys in the “right” place, so there’s no guarantee that a tenkeyless version would appeal to me. So, the smaller size would be nice but it’s not going to save that much weight, and the full-size version will probably make me happier most of the time. So, since I’m typing this on my Surface Pro 3 keyboard and I’d like to stop that now, I will quit here. Keyboard Company lists the keyboard as in stock now, though I haven’t gotten a shipping notification and their web tracking function doesn’t list my keyboard as shipped yet. I’m sure that will change soon; I’m just happy I don’t have to wait much longer now that they’re in stock!